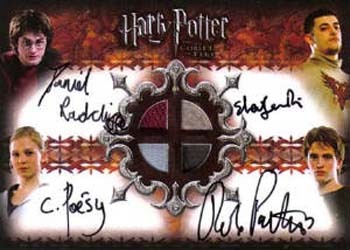 2006 Artbox Harry Potter and the Goblet of Fire Update has one of the most important autograph cards in the history of the modern hobby. At the same time, it's not driven by that single card. 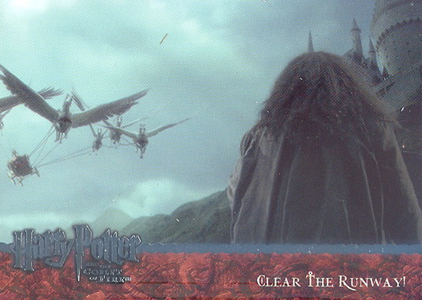 Like most every Artbox Harry Potter trading card release, Goblet of Fire Update has a deep lineup of premium chase cards and a clean, informative base set. 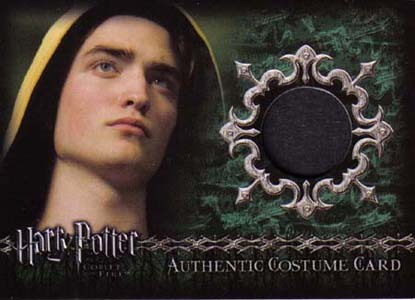 The top card in the release is a quad autographed costume card featuring Daniel Radcliffe, Robert Pattinson, Clemence Poesy and Stanislav Lanevski. While the final two names create little excitement outside of their supporting roles in the film, Radcliffe and Pattinson are huge. As the face of the Harry Potter franchise, Radcliffe's place in history is assured, much like Mark Hamill, Harrison Ford and Carrie Fisher were following the original Star Wars trilogy. Pattinson is in a similar position, however for his role in the Twilight films, where he played Edward. 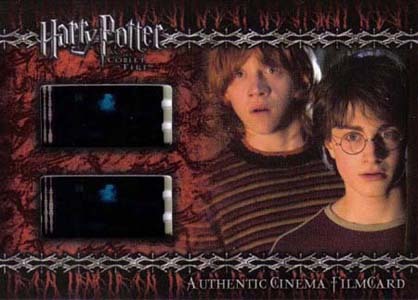 When 2006 Artbox Harry Potter and the Goblet of Fire Update first came out, it was an important card for Harry Potter fans. In the years since, it has taken on a lot more significance. 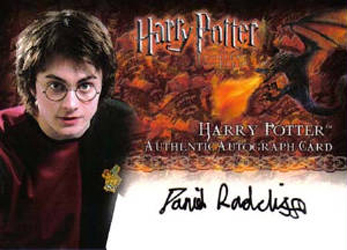 Daniel Radcliffe also has a regular autograph in the release as well. The other major signer is David Tennant, who found mainstream appeal after starring for several seasons on the updated Dr. Who. 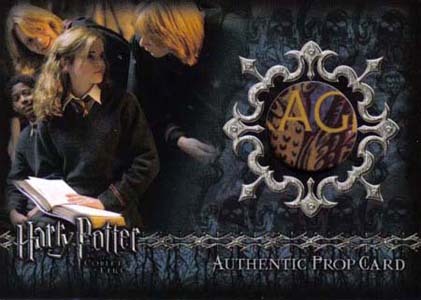 2006 Artbox Harry Potter and the Goblet of Fire Update also has the familiar mix of numbered costume cards, prop cards and Cinema Film Cell cards that have a couple of celluloid frames embedded in them. Most hobby boxes should have a costume card and either an autograph, prop card or film cell card. The base set is literally a continuation from the first series. Released around the time of the film's DVD release, images include a lot of the special effects shots and more spoilers than the first series. Numbering starts are 91 and runs through 180. Every card but the last one helps tell the film's story. The final card is a checklist. 2006 Artbox Harry Potter and the Goblet of Fire Update hobby boxes come with 24 packs of eight cards. 90 cards. Numbering continues from where the first set left off. 95 I'll Bet That Cleared Your Sinuses! 106 What Should I Have Her Do Next? 131 A Dragon Or A Date? 132 I Didn't Catch That? 146 She's My Friend Too! 148 The Youngest Triwizard Champion? 164 Together -- One, Two, Three! 166 Get Back To The Cup! 167 What Do You Want? 172 How Lies Have Fed Your Legend! 179 What Was It Like? Quad card distributed as a redemption. Nine cards. Inserted 1:80 hobby packs. Numbered to 350. Inserted 1:24 hobby packs. C1, C2, C3, C4, C7 feature material used to make costumes. Others are from screen-worn costumes. 11 cards. Inserted 1:80 hobby packs.